A Midwesterner, James Thornton received a Bachelors and Master of Music degree from University of Illinois, Champaign-Urbana where he studied violin and string pedagogy with Paul Rolland. He was awarded a Fulbright scholarship to further his studies with Eduard Melkus at the Hochschule für Musik, Vienna, Austria where he lived for a number of years. In Chicago, he studied violinmaking and restoration with Zenon Petesh while employed at Kagan and Gaines and finished his training at Michael Becker Fine Violins, Park Ridge, Illinois. Since year 2000, he has been running his own shop. He has done repair and restoration for the Weisshaar family in Costa Mesa, California and for Christopher Reuning in Boston. He is a member of the American Federation of Violin and Bow Makers. Jim and his wife Susan (also a violinist) live in Wisconsin in a solar powered home. 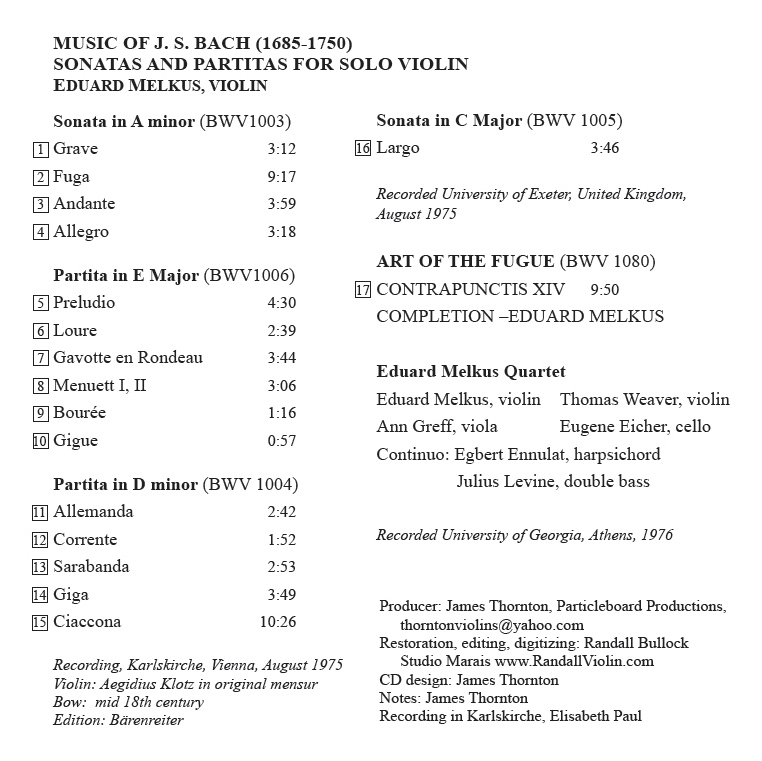 In 2015, Jim produced his first CD – J. S. Bach Solo Sonatas and Partitas and Art of the Fugue with Eduard Melkus performing on an unaltered Aegidius Klotz violin. Rare live recordings of award winning violinist Eduard Melkus, painstakingly restored from a performance at Karlskirche Vienna Austria. ​This recording offers a completion of Contrapunctus 19, from the ‘Art of the Fugue’ (left unfinished at Bach’s death), written by Melkus himself. The 14 page illustrated booklet includes insightful analysis of the music and its relationship to Baroque architecture, by violinist James Thornton. James Thornton has contributed a sophisticated program note, with particular emphasis on the influence of Baroque architecture on Bach’s music. 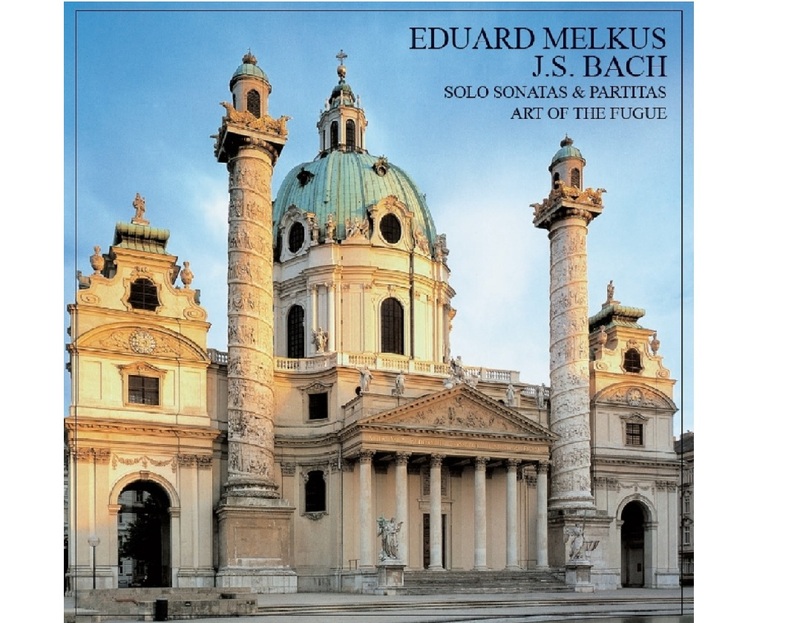 This CD offers a rare opportunity to hear violinist Eduard Melkus, one of the founders of the period instrument movement, play solo sonatas and partitas of Bach in concert. The performances of the Second Sonata and Second and Third Partitas feature an Aegidius Klotz violin from around 1760, one of the few instruments to survive from this period basically in its original state. 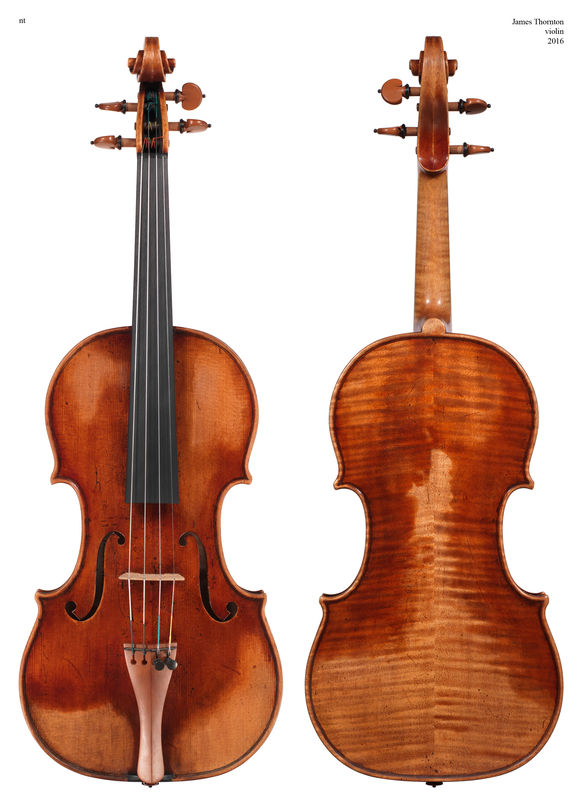 According to Wikipedia, Melkus did not use gut strings on this violin. He also employed a chin rest, modern pitch, and continuous vibrato. All of these practices are ahistorical, so that more recent period instrument players tend to regard Melkus as something of an anachronism. In all honesty, I can’t tell how many of these details hold true for the present recital, and the album booklet presents no relevant information. That said, Melkus’s performances here are to be treasured for their passion and insight, plus a sense of style that has not gone out of date. 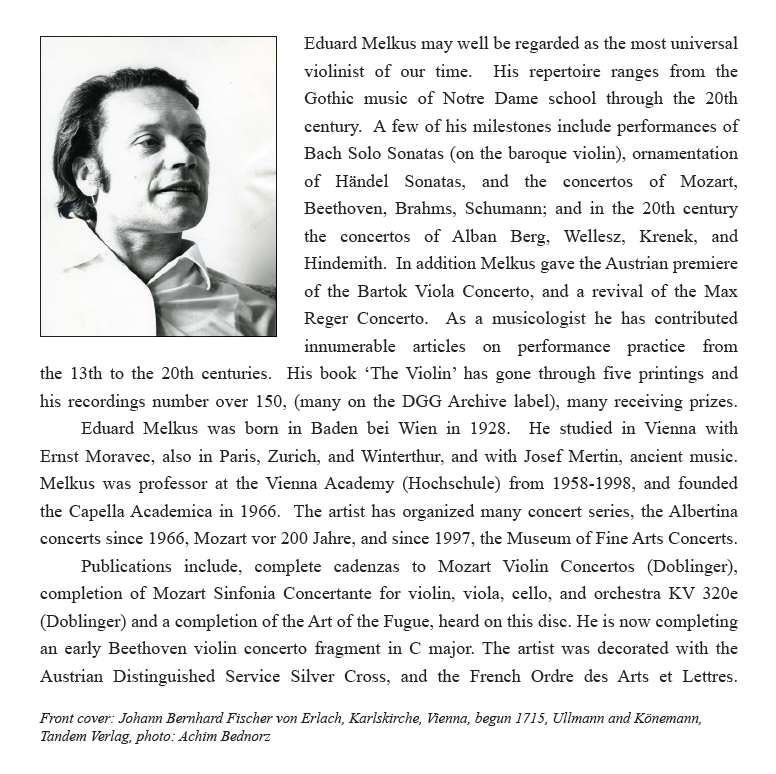 I think Melkus had an instrument that suited his purposes, and these performances are among the essential recordings of these works on any type of violin. James Thornton has contributed a sophisticated program note, with particular emphasis on the influence of Baroque architecture on Bach’s music. One can hear this most notably in Melkus’s reading of the Fuga from the Second Sonata. Bach erects a solid, overarching sense of structure. There is a feeling of space, within which elements of design move—creating shapes that ornament and decorate the total edifice. The movement parallels the illusion of motion in contemporary buildings. The sonata’s concluding Allegro here is like a Baroque painting of Christ’s ascension, with billowing waves and gusts of air. Melkus executes the Third Partita’s Preludio so that it offers the remarkable effect of two soloists in close harmony, as in a Vivaldi concerto. For the Gavotte en Rondeau, Melkus secures elegant phrasing, which can prove too cumbersome to execute on a modern instrument. The Sarabanda of the Second Partita here is like a courtly dance imbued with the energy of the rising bourgeoisie. Melkus’s interpretation of the climactic Ciaccona is bound to raise a few eyebrows. It is fast, requiring less than two-thirds the time of Joseph Szigeti’s performance. In place of the stately and philosophical renditions of some violinists, Melkus gives us a thing like the most outlandish fantasy of the great Italian violinist-composers, reminding us that Bach himself was a fine violinist. Melkus’s account possesses the burning emotional fervor of a painting by El Greco. Like the Spanish master, Bach via Melkus seems to alter time and space through spiritual and imaginative experience. One of the great musicians of our time in terms of his work on Johann Sebastian Bach, both as a violinist and conductor, is Eduard Melkus. Over the past 65 years or so he has made so many contributions to our understanding of the music of Bach and his times that by himself has achieved a sort of iconic stature. He is not just a performer of note, but also a recognized scholar whose book Die Violine is probably the most significant on the instrument to appear since the 18th century treatises by Tartini and Leopold Mozart. Moreover, as a close friend of period performance such as Gustav Leonhardt and Nikolaus Harnoncourt, he has both participated in their revival of the art of early performance practice and been one of the significant models whose work was seminal in our ever-evolving knowledge of how the music of this period was played. 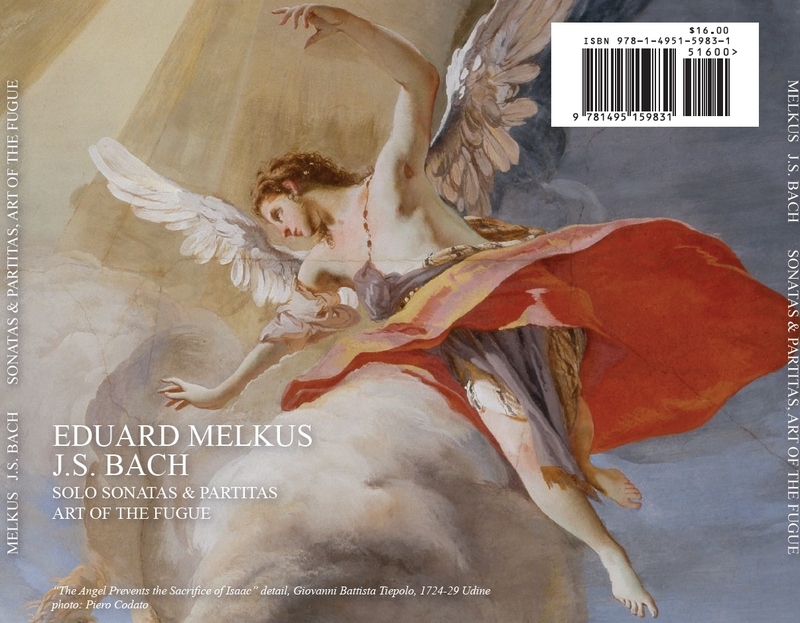 As multifaceted a performer and conductor as he is, Melkus has also devoted considerable energy to his editorial work, creating new and more critical editions of music of the Baroque. Moreover, he has also devoted compositional skills towards the completion of several fragments, including the Mozart Triple Concertante for violin, viola, cello and orchestra (K 320e) and a current project of an early Beethoven second violin concerto. So, his ordinary day job as Professor at the Wiener Musikhochschule in Austria seems almost an anticlimax for his extraordinary achievements in the discipline. While such accolades may seem too overt to some, his 200 or so recordings are ample demonstration of his musical acumen, though many now have gone out of print (save for the ubiquitous downloads). Therefore, this disc, remastered from recordings done in the 1970s, is a welcomed reissue that reinforces the contributions he has made, both to scholarship and performance practice. Accompanying this collection of solo violin works by Bach, including his own extremely viable completion of the Contrapunctus XIV, which was “completed” by Bach’s son Carl Philipp Emanuel as a three-voice fugue. The two solo sonatas and two partitas are some of the most complex and intricate works for solo violin ever composed. The lack of bass line exposes the performer to the need to bring out all of the voices simultaneously without help and in a manner where musical pitfalls abound. The finale of the D minor Partita, a humungous Chaconne, has been the downfall of many a violinist, amateur and professional, as its 64 sequential variations run the gamut of performance difficulty. No wonder that numerous “adaptations” of it exist, all failing to achieve the grandeur and scope of the original. Melkus attacks this monument with vigor and power, later on in the more sedate variations giving it a softer, more mystical quality, and as the intensity and difficulty increase towards the end handles the virtuosity without batting an eye. This is the way this particular piece ought to be played, and here, followed by the plaintive Large of the C major Sonata, the monumental nature of the work is all the more apparent. The complex fugue of the A minor Sonata, almost as complex and difficult as the Chaconne, is done with such clarity that all of the voices are easily distinguishable, and Bach’s hidden bass lines spring out of the text. The lilting and bouncy Gavotte of the E major Partita shows an almost playful side, for here Melkus uses a jaunty phrasing that brings out the dance-like qualities. Of course, similar comments are in order for each and every track on this re-release. Suffice it to say that this is Bach that is a revelation, both when it was first recorded and even now after four decades it remains fresh and inspirational. The final work is his completion of the Contrapunctus, here set for a string quartet, though the original is of course for keyboard. After looking at the architectonic structure of the work, Melkus came to the conclusion that the “3 sogetti” really ought to be four, and his conclusion, beginning with Bach’s final signature motive (B-flat-A-C-B natural, for those few still unaware of the acrostic), provides a logical and effective fourth subject for the counterpoint, increasing the complexity of the work in a way that ends the monumental tome of fugues well. It may not have been what Bach actually envisioned and indeed the choice of strings was probably not on the composer’s mind, but it does work. Along with this music can be found wonderfully entertaining notes that run about from Baroque architecture to the rather well-written and carefully documented descriptions of the music itself.